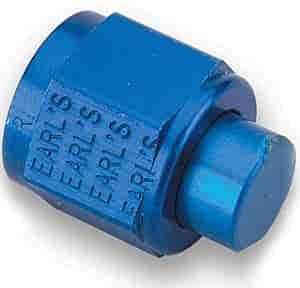 Earl's AN Cap and Plug Fittings are blue anodized aluminum for durability and great looks. They're available in common sizes for servicing AN hose assemblies (to close off adapters) and hose ends (to prevent contaminants from entering exposed orifices). 592906 is rated 5.0 out of 5 by 1. Rated 5 out of 5 by Shifter from Best quality Can't go wrong with genuine Earl's products, fit and finish is as expected. I've had knock-off versions and you need to use sealer. I've found that Earls seals perfect without any sealer.